On this day, twenty-eight years ago, the Industrial Bank of Japan along with several other banks made public that they were lending the Oriental Land Company $300 million to build a Disney theme park. I know a lot of people are confused when they realize that the Tokyo Disney Resort is not owned by the Walt Disney Company. A Disney theme park not owned by Disney? How can that be? Business being what it is and all, a number of events happened to create this very unique situation in the Disney World. Let's start where every story starts. Back in the late 1970's Walt Disney Productions(now known as the Walt Disney Company) was building a little theme park we like to call EPCOT. Now, even though Walt had passed from this world for over a decade and there was, at times and in areas of the company, a lack of direction, some areas of the company still focused on a great deal of attention, detail and quality to the parks. EPCOT was costing the company millions and millions of dollars in cost overruns as it moved toward completion(the final bill would be over a billion dollars in 1982 dollars, friends). Now around this time a company known as the Keisei Electric Railway Company was also having financial difficulties in Japan. Through their real estate holding company, known as The Oriental Land Company they just happened to own a piece of land near Tokyo's harbor and came up with the idea of getting Walt Disney Productions to build a park there. 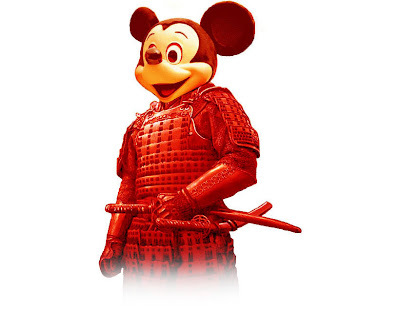 Knowing the Japanese love of Disney characters, the company thought it would be a great way to get out of debt and what better way than getting the Mouse to build a park in the land of the rising sun. Well, when they approached the company, Disney said no. EPCOT was costing so much money that the company couldn't afford to finance such a venture. Not to be deterred, Keisei Electric Railway Company and its partner the Mitsui Real Estate Company, the two companies that created the Oriental Land Company in 1960 deciced to have the OLC make Disney a very enticing offer. Within a short amout of time the OLC hammered out an agreement with Walt Disney Productions that seemed like a great deal for the cash strapped rodent. They wouldn't have to put up a penny. The Oriental Land Company would build the park and in return for Disney licensing out it's characters and allowing the Japanese company to use the Imagineers, Disney would get a 10 percent royalty on all admissions to the park. They also received a 5 percent royalty on all merchandise and concessions(This would be similar to the deal agreed upon to expand the park into a resort and Second Gate). Seemed like a winner for Disney. It incurred no financial risk and reaped the benefit of the park should it be a success. And there was a good chance of that given Japanese love of the Mouse. The close proximity to Tokyo was also a great comfort since the park would be near an extremely large population. It would be equivalent to Disney building a park on the harbor in New York City. There would be that many people within a very short distance. And so the foundation for Tokyo Disneyland was created. Tokyo Disneyland opened up in 1983 and has since gone on to become the most visited Disney theme park in the world. By the time the OLC got around to deciding to expand on their success and turn this one park into an entire resort, well over 17 million people a year were going through the turnstiles. If you would like to read more about the origins of the Oriental Land Company then get a copy of "The Prince of the Magic Kingdom" by Joe Flower. I don't think Tokyo Disneyland is the world's most visited park... all of the data I find shows WDW's Magic Kingdom as #1, Disneyland as #2, and Tokyo Disneyland as #3. Tokyo is the world's most visited PARK. WDW with its 4 theme parks is the most visited RESORT. Magic Kingdom is the most visited AMERICAN PARK. The Tokyo Disney Resort takes in around 24 to 25 million total... WDW, when I last looked at the figures was around 40 or so million, give or take. But Tokyo Disneyland is the world's most visited park. I've seen attendance figures for the parks and Tokyo DL always winds up number one or two, but most years it is number one. I can vouch for what Honor said about Tokyo getting 17 million back in the late 80's and 90's. They go nuts over there. The stateside parks have had an increase in the last couple years, but I'd be surprised if Magic Kingdom were to take the crown over. Maybe once every few years, even Tokyo has a downswing, but it will beat the American parks when it comes to attendance four out of five years. It makes sense that Disney needed financial help back in the late 1970s and early 1980s, which is why OLC got involved. The question is, when they have such enormous free cash flow now and are raking in billions in revenue every year, why do they continue to seek overseas partners, as in Hong Kong Disneyland and Disneyland Paris? Why can't they fund expansions to Future World and World Showcase at Epcot themselves? Why are they selling off land around Disney World? How come the last place Disney seems to want to put its own money is in its theme parks? Hal, the things you just said are false accusations. The invest LOTS of money in their parks all the time. One key point about TDL was that Disney did want to build it but Japanese laws did not allow foreign ownership of companies. Therefore, The OLC was created and the royalty scheme worked out. As far as attendance..they are #1. Even while I was there at an off peak time the park was crammed. It may have then, but I don't think it does now. How else would you explain a company like Ford owning Mazda back in the late 80's. Still, I know from friends that Disney was so in dept over EPCOT that it makes sense they didn't have the money to invest. They were probably too afraid to pour more money into another park until they were sure EPCOT would have made money. The OLC spends huge sums of money on that resort. Do any of us think that the Disney Company back under Eisner would have built Tokyo DisneySEA? Much less, have spent 2.2 billion on it? Sadly, I don't think so. Hopefully the situation has changed with Iger now in charge. Well, not all the time, kingcrab. They were really tight with investment under Pressler during the latter part of Eisner's reign. And other than Euro Disneyland, the company under Eisner never took any project on like EPCOT. They did propose some very big project, WestCOT and Port Disney, but they never followed through. Iger has yet to make even the kind of investment that went into Euro Disneyland, but I don't think he plans to. He sounds like he'll take a middle road. Far more than what was spent on DCA, WDSP or HKDL but much less than Euro Disneyland. I could be wrong, but I think he's learned from Eisner's mistakes... at least, I hope he has. Honor, don't tell me you're trying to bash Iger now, please. He's been doing such a great job of getting the Disney company back on its feet following Eisner's reign of terror. After all, it's wrong to just pass judgement on people like that. And pessimism won't get people very far, either. According to this site, TDL isn't the most visited park. Not in 2006 that is. I don't know where it is you're talking about as for me bashing Iger, kingcrab. All I stated was that he's taken a middle path and it appears he's learned from Eisner's mistakes. I wouldn't exactly call that bashing him. If you were referring to my statement that he hasn't invested amounts of money like what went into EPCOT or Euro Disneyland those are simply facts, not bashing. I'm not saying I want him to... I don't want Iger to spend so much that the company gets into financial trouble. I do want him to spend much more than Eisner was doing in his final decade. Oh, and Roald... Tokyo may not have been the number one last year, but it tends to be the number one park most years. What I was referring to was when it opened in the mid to late 80's all the way through the early 90's. It was the number one park in the world. It had around 17 million back around then and the Magic Kingdom wasn't close to those numbers. This was when there were two or three parks at WDW instead of the four they have now. But TDL makes the Magic Kingdom look dead on most days... there's just that many people that go to the park. Either way, that was one of the final lines in the post and not really what that post was about, btw. There seems to be some confusion about Tokyo Disneyland's attendance. The truth is that it USED to be the most visited theme park in the world, with an average of 17 million visits a year. When Tokyo DisneySea opened average attendance to Tokyo Disneyland dropped to around 13 million, and DisneySea brought in around 12 million. That was still a net gain of 7 million visitors per year. The Magic Kingdom is now the most visited theme park in the world. "The invest LOTS of money in their parks all the time." Yes, it's lots of money, but is it enough? That's the question many critics of the last three modern Disney parks, HKDL, DCA, and WDSP, ask. The figure often thrown around is 4 billion for DisneySea. The figure often thrown around for DCA is 700-1.4 billion. Even with the 1.1 billion makeover, they still spent less on DCA than the OLC did TDS. I had no idea that Disney doesn't own Tokyo Disney Land. 1. Which steps was taken to establish TDL? 2. How was the opening weeks? Which problems they had? 3. How was the first year? succesful or not..which problems they had..